Best known for his trippy and ultra-dark animation for Flying Lotus’, Kill Your Co-Workers, Mike Winkelmaan — known as Beeple — strikes again with ‘IV.10‘. 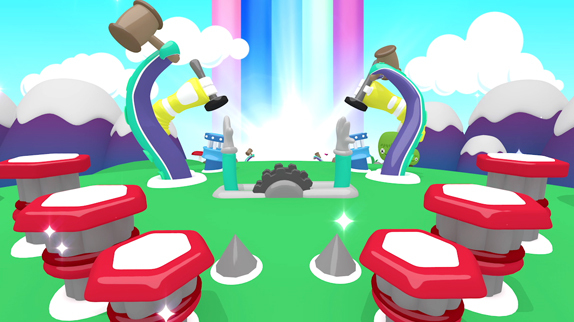 When the video-game style journey kicks off, you are transported to an extreme animated world of bright block characters where synchronized audio and video rule. As Beeple tells The Creators Project in an interview: “if something happens in the music, it should have some visual representation”. To a point where you can literally see every note of what happens in the music. Deeply rooted in his belief that visuals help illustrate little nuances in a piece of music, Beeple’s unrelenting conviction that video and audio are meant to have a one-to-one correlation materializes in this gem of a video — and we begin to wonder just how this painstaking process of meticulous attention to detail was even possible and how long it took to get there (1 year of working in spare time). And Beeple does just that … he shows us the light. Paving the way for more open source music, he has released the entire Cinema 4D project file for IV.10 so that people can download it, see how the film was made, and remix as wanted. Pretty awesome. Animating and producing this monster of a video was no easy feat and we can’t wait to see more from Beeble. Preferably in less than a year though.